The University of Connecticut, in what clearly seems like an attempt to get ahead of damaging news, has announced an “extensive” investigation into research misconduct involving one of its scientists, Dipak K. Das. According to a press release, the university has notified 11 journals that published Das’ work about the alleged fraud. One area of interest for Das, a government-funded professor of surgery and director of the Cardiovascular Research Center, has been resveratrol, a substance in red wine that has allegedly been linked to improved cardiac health. The university touted some of his early efforts in this field. An extensive research misconduct investigation has led the University of Connecticut Health Center to send letters of notification to 11 scientific journals that had published studies conducted by a member of its faculty. Dipak K. Das, Ph.D., a professor in the Department of Surgery and director of the Cardiovascular Research Center, was at the center of a far reaching, three-year investigation process that examined more than seven years of activity in Das’ lab. The investigation was sparked by an anonymous allegation of research irregularities in 2008. The comprehensive report, which totals approximately 60,000 pages, concludes that Das is guilty of 145 counts of fabrication and falsification of data. Inquiries are currently underway involving former members of Das’ lab; no findings have been issued to date. As a result of the investigation the Health Center has frozen all externally funded research in Das’ laboratory and declined to accept $890,000 in federal grants awarded to him. Dismissal proceedings, in accordance with the university’s bylaws, are currently underway. The UConn Health Center worked closely with the U.S. Office of Research Integrity (ORI) throughout its internal investigation. Following protocol, the Health Center has sent its complete report to the ORI which is now conducting an independent investigation. The second title, Antioxidants & Redox Signaling, is noteworthy, as Das is one of the editors-in-chief. [See 11:30 p.m. update below] He’s also He was an associate editor (no longer, according to editor William Stanley, see comment below) of the American Journal of Physiology: Heat and Circulatory Physiology, and consulting editor of Molecular & Cellular Chemistry. So, he obviously had a pipeline to those journals — although commenters dispute that would be the case. Das’ work has been influential. Thirty of his papers have been cited more than 100 times, according to Thomson Scientific’s Web of Knowledge. One, in Toxicology, has been cited 349 times, while another, in Free Radical Biology, has been cited 230. We’ll be posting more details on this case as we learn them. Update, 12:00 Eastern, 1/11/12: Das appears to have had a relationship with a Las Vegas resveratrol maker called, unsurprisingly, Longevinex. The company has promoted his research, and Das also shows up in a lengthy video touting the nutrient as the next aspirin. The infomercial is guided by an “investigative reporter” named Gailon Totheroh, who is affiliated with the Christian Broadcasting Network. There are many investigators who are working on resveratrol. That doesn’t mean we know the whole truth. But Rome wasn’t built on Dr. Das. More: Turns out Das won the “Albrecht Fleckenstein Memorial Award for distinguished work in the field of Basic Research” last year from the International Association of Cardiology. We also have learned that Das helped found did work for a company, Dry Creek Nutrition, in Modesto, Calif., to commercialize a substance in grape skins called proanthocyanidin. Dry Creek received a U.S. patent in 2002 for a method of purifying the molecule. Das has published numerous papers on proanthocyanidin, including articles in journals implicated in the U Conn inquiry. Among them are papers in Free Radical Research, Free Radical Biology and the Journal of Molecular & Cellular Cardiology. Another update: The Chronicle of Higher Education’s Tom Bartlett covers the story, with comments from resveratrol booster David Sinclair. Bartlett also has links to a 49-page executive summary of the 60,000-page report, and to Das’ long and rambling’ response to investigators that accuses the university of discrimination and claims he suffered a stroke because of the stress. Las Veags, NV (Jan 11, 2012) – Bill Sardi, managing partner for Longevinex®, a resveratrol-based dietary supplement, says the product his company makes has passed independent scientific scrutiny in human studies conducted both in the USA and overseas and that the animal-lab researcher at the University of Connecticut who has conducted studies involving Longevinex® and whose work has now come under scientific scrutiny, has no business relationship with Longevinex®. Sardi says, to his knowledge, criticism of Dr. Dipak Das’ work at the University of Connecticut primarily involves irregularities in a test called western blot analysis which would not alter the findings that Longevinex® has been proven to reduce the area of scar tissue following a heart attack in excised rodent hearts. Actual photographs showing the amount of scarring following a heart attack provide incontrovertible evidence that both resveratrol and Longevinex® protect the rodent heart prior to a heart attack by activating protective molecules such as nitric oxide, adenosine and heme oxygenase prior to a heart attack, says Sardi. “None of the allegations that I have briefly read in newspapers negate the pioneering work of Dr. Das, who first showed that resveratrol can turn a mortal heart attack in animals into a non-mortal event,” says Sardi. The implications of this discovery are profound given that aspirin has just recently been found to be ineffective in reducing the risk of a mortal heart attack in humans, adds Sardi. The proposed health benefits involving Longevinex® have been corroborated by independent studies conducted by National Institutes of Health researchers as well as researchers in other centers in the USA and overseas, says Sardi. Links to these reports are provided herein. As early as 2008 resveratrol researchers confirmed that Longevinex® activates 9-fold more genes than plain reseveratrol in rodent hearts. Sardi says his company has received reports that patients whose coronary arteries were 99% blocked by plaque experienced no chest pain or damage to their heart, evidence that Longevinex® was cardio-protecting the heart. Sardi says his company has received a report from a cardiologist that an 89-year old man taking Longevinex®, who was judged to be too frail to undergo invasive heart surgery and who had a completely blocked coronary artery, experienced no heart damage and circulation was restored over time on its own. Normally the heart releases protective antioxidants following a heart attack, when blood circulation is restored to a coronary artery that provides the heart with oxygenated blood. But resveratrol, and more so Longevinex®, releases these protective molecules prior to any adverse event, such as a blockage in arteries supplying oxygen to the heart or brain, says Sardi. “One has to be alerted to the possibility of a witch hunt here,” says Sardi, “since Dr. Das has made landmark contributions to the understanding of resveratrol and how it works. There are billions of dollars of drug sales that are threatened by resveratrol, which not only protects the heart prior to a heart attack, but thins the blood and prevent clots in coronary arteries, inhibits inflammation, controls cholesterol and dilates (widens) blood vessels to maintain normal blood pressure. Resveratrol and Longevinex® threaten to replace many problematic heart drugs which have not been demonstrated to reduce mortal heart attacks,” says Sardi. Sardi says his company underwrites some of the costs of conducting studies by independent researchers by providing product for analysis and by underwriting of some of the costs involved in testing and that his company played no role in the design or outcomes of any of the published studies that have now been called into question. Dr. Das is not a paid consultant to Longevinex® says Sardi. The news media chose to implicate Longevinex® in the allegations against Dr. Das without first contacting the company for a response, says Sardi. “Longevinex should not be considered guilty by association,” says Sardi. Dr. Das is attending a scientific conference in India and has not been able to respond to the allegations. We have now had opportunity to read the entire report by the University of Connecticut and find it particularly disturbing in its details and implications. As a company we do not wish to be associated with scientific research that does not meet the highest level of scientific standards. We stand with the University of Connecticut in its efforts to root out any scientific fraud. Update, 11:30 p.m. Eastern, 1/11/12: Das has apparently been relieved of his duties as editor in chief of Antioxidants & Redox Signaling. Although we have yet to confirm a report of this by one of our commenters, his name has been removed from the masthead of that journal sometime today. Center review board claims all of the allegations against him can be “easily refuted” and that the charges against him involve prejudice within the university against Indian researchers. Six other East Indian researchers were also named as “potential respondents” to charges of scientific fraud, but no researchers of other ethnicities. • The university’s report stems from a paper published in a 2008 issue of Free Radical Biology & Medicine, a peer-reviewed journal. Why did the university choose to wait three years to publish these allegations that were refuted by Dr. Das over two years ago? No retraction of that published report was called for at that time. • Dr. Das was blind-sided by the university, being completely unaware of the release of these allegations to the news press. Dr. Das had to be informed of the negative news reports by his colleagues. He was prevented from making a timely response to all of these charges. The news press reports Dr. Das did not return phone calls, which is pejorative, as he was away from his desk and was not monitoring his calls. • The University of Connecticut report alleges Dr. Das “defunded” the work of a student in his lab because she did not produce results that he wanted. Investigation into this matter shows that Dr. Das “defunded” the work of this researcher from his budget because she was devoting all of her time to another researcher in the same laboratory, who turns out to be the informant or “whistle-blower” in this case, the very same person who also had a key to Dr. Das’ office. • Another student researcher who worked in Dr. Das’ laboratory in 2008 discloses that the informant in this case was a trouble maker who chased away many other researchers by intentionally causing friction in Dr. Das’ lab. The former student says the university informant in this case even attempted to “pour wine down her mouth,” hoping to get her to reveal negative things about Dr. Das. The student says she did not witness any scientific irregularities in Dr. Das’ lab during her tenure there, which included Western Blot tests that were alleged to be doctored. • Another party, a university internal investigator whom Dr. Das accuses of long-standing prejudice against foreign-born researchers, reportedly broke the lock on Dr. Das’ office door, removed computer files and personal items such as bank records and a passport, and could have manipulated data in his computer files. Dr. Das says this university investigator has had a long-standing vendetta against him going back to 1984. • Dr. Das says he has not personally conducted laboratory bench tests for many years now and that his students and other subordinates conducted all the tests, including the allegedly doctored Western Blot tests. Even if doctored and inaccurate, these tests in no way invalidate the many health claims associated with resveratrol, a red wine molecule. Dr. Das says most of his work has been corroborated by other researchers including his important finding that resveratrol protects the heart against damage prior a heart attack. • While the news media made quick association between Dr. Das and a particular brand of resveratrol pill he has tested, Dr. Das has no commercial relationship and does not serve as a paid consultant to any manufacturer of resveratrol pills. He served as an unpaid expert for an online interview of a particular brand of resveratrol, a pill that his laboratory found to be superior to plain resveratrol in laboratory studies. A spokesman for that company, Bill Sardi, managing partner for Resveratrol Partners LLC, dba Longevinex®, says his company has donated product to researchers including Dr. Das’ lab and has underwritten some of the expenses involved in conducting tests, but no researchers have received pay offs or have personally profited from their studies involving his product. Mr. Sardi says his company has not sought to influence the outcome of any independent or sponsored studies. Resveratrol Partners LLC is a private company based in Las Vegas, Nevada. A 60,000 page report! Amazing. It most likely counts exhibits as pages. The “comprehensive report” has 60,000 (sixty THOUSAND) pages? Is that true? Is anyone going to read it? My guess is that there is probably a lot of raw data in there. If you’ve ever tried to print out a large excel sheet you’ll see how quickly your printer runs out. Still, this is quite amazing, would like to get some more details! But I am truly happy that they started such a complete investigation! It could be used as somebody’s desk. He did really drink the red wine! He looks healthy on it. Perhaps he was drunk all the time, and that impaired his moral judgment! I hope it is not true though, as I am becoming more and more worried about the damage that is being done to the technique. Western Blot needs standards that everyone can follow. Agreed, but how? Not as easy as you might think. How about a small group of experts publishing a paper that is all methods, verifying something we already know, and spelling out exactly how to do it? Then everyone can reference that paper, and say, we did it that way. Needs financing, preferably government. Pie in the sky, I know. But we’ve got to start somewhere. It is nauseating to read so many retractions and exposures of people manipulating Western Blots in not so creative ways. Impossible. Western blot membranes, antibodies, substrates, etc are highly variable and there are literally volumes written on tweaking and troubleshooting your blots. Many a talented grad student has pulled his hair out over a stubbornly poor blot despite little fault of his own. The trouble consistently seems to lie in the manipulation of the digital image representations of the blots, not anything inherent to the technique itself. J. Cell Biol. published something like this a while ago. It may not be the end of the conversation, but it seems like a good starting point. Researchers should be required to send in unedited scans of the blots with the papers. There is no reason why the majority of papers cannot have links at the bottom where you can download the actual data that the figures are generated from. That image in the linked article is a bit misleading, as it served as an example of how the report defined splicing and cutting, according to the 40 page summary report linked in the retraction watch article above. Das never actually manipulated that figure, but the 40 page summary goes in to extreme length of illustrating those blots that he did manipulate. Their method is apparently very repeatable. At first, I thought this was an example of fraud that wasn’t paid for by industry money. Then I read about Das’ involvement with Longevinex… maybe he approached them, flush with the thought that his fraud hadn’t been discovered. I’m glad that an anonymous whistleblower was listened to, and that a thorough investigation was done. Effective government based on reasonable regulations. Most important, the loss of Das’ “findings” won’t affect resveratrol research. Some good news for once, even if it did take 60,000 pages. There is an error in this article: Dipak Das in NOT an associate editor of the American Journal of Physiology: Heat and Circulatory Physiology, nor is he on the editorial board. He has no “pipeline” to our journal. Is that information correct, Dr. Stanley? We’ve contacted Dr. Stanley for clarification about whether Das was — as claimed on his CV — ever an associated editor of the journal, and if so, when that relationship ended. Dr. Das was an Associate Editor, but that was terminated in 2008. So, Dr. Stanley, are we arguing about what the meaning of the word “is” is? Your comment is technically correct, but you could have shed some light on the subject by adding that Dipak Das once was an associate editor of your journal, although he is no longer, and that the separation occurred some time ago, not in the past few days, as happened with other of his appointments. You also said in your comment that Das has no pipeline to your journal. Does this mean, in parallel with your first denial, that he once did have a pipeline to your journal but he no longer does? Or do you mean to say that he has no pipeline and never did? I must remark that the fuller explanation of the situation, after your initial, misleading denial of a relationship between Das and your journal, generates my further question about the pipeline. Das appears in a somewhat less bad light now that we know he is not making up the associate editorship out of whole cloth. The fact that someone with knowledge of the situation had to corner you and make you offer a fully truthful response does not inspire confidence. Adam, could you link to the press release? Added — it wasn’t available online when we first posted. Thanks. Of course, its just another example of the serious failings of the academic literature: http://www.tcpinnovations.com/drugbaron/?p=160 The ones that are discovered, investigated and turned into 60,000 page reports are just the tip of the iceberg. Im guessing 1 in 100 of all cases of misconduct get as far as a retraction. The rest just lead to damaging misinformation (and the occasional $720M purchase of a company based on fantasy, albeit fantasy published in reputable journals). As per Bill Stanley’s post above, the notion that someone on an editorial board has a “pipeline” for publishing freely, is not founded on any fact. I sit on the boards of 4 journals (including AJP Heart) and I WISH this was the case. I simply is not. I don’t know of any journals which subject the papers of their editorial board members to lesser of a peer review than those from outside. Occasionally Associate Editors might find it easier to publish review articles, but for original scientific articles the rules are the same for everyone. That being said, WOW! This guy is huge. He’d been firmly on my list of “something fishy going on there” for some time, and it looks like my suspicions were correct. Here in Brazil where ethics were never among the national specialities, certainly associate editors find more than enough room in their periodicals for all of their papers. Just sum up the number of ‘house papers’ within Farmacognosia, Oecologia Australis, Memórias do Instituto Oswald Cruz, and many others… I know by first hand that many editor submissions are quickly evaluated by friends before final publication. Obviously, something of that sort would not go down well, if it was visible to everyone. All an editor needs to do is ensure that certain papers from friends go to certain (friendly) reviewers. You get to know people well at conferences and over drinks. Networks full of conflicts of interest develop. All one needs to know is who is favorable tho whom in the field, and to set up a little shadow market of favors. You channel papers to the right people and that makes a huge difference in the outcome. For example, you get an article by some guy you dislike? Well, paper goes to Dr. Nasty why trashes all papers. Or to Dr. Against, who you know hates a certain approach. You get a paper you want published, you send it to Dr. Friendly, or to the guy who owes you one. It is very easy to use stealth methods to stack the cards in favor or against someone, and that is what is going on. Of course, nobody would admit to it openly. Paul Brookes wrote ‘for original scientific articles the rules are the same for everyone’, which quite rankly made me laugh. If you look at the backscratching and ‘chosen’ editors of many, dare I say ‘rather dubious’ original articles you’d quickly see many editors of journals publish many of their papers rejected from other journals in their journal rather easily. How did anyone even read these??? It’s possible that they had had a “rejected but encouraged to resubmit” decision first time round, when perhaps “acept with minor corrections” would have been more suitable. I son’t know teh journal at all, so this is total speculation. I have not seen any other papers in this journal apart from the editors that have this fast acceptance. He has now been relieved of his duties as Editor-in-Cheif of Antioxidants & Redox Signaling. IIRC, the EIC of Antiox Redox Signal is Chandan Sen, and was never Das. Sen founded the journal and has served as its EIC ever since. As for the Longevinex affair….. Hahahahaha! Best laugh I’ve had all week. “Mortal heart attack in a rodent” (its an in vitro model, the rat is already dead!). “Actual photographs of scarring”, what, taken with a real camera? Really? “Longevinex activates 9 times more genes”…. Pardon my French, but WTF is that supposed to mean? These are not the words of a credible scientist? Oh, and the 6 papers Sardi provides links to, all have Das as an author. Not a good choice of references there. Sardi’s claim that resveratrol will replace heart drugs that are ineffective… Complete bunk. There is not one single FDA approved medication for the reduction of myocardial infarct size (see PubMed ID 19506318). There have been some spectacular failures in clinical trials (acadesine, cariporide and others). How can resveratrol replace drugs that dont even exist in the marketplace? None of the major pharmas has had an AMI (acute myocardial infarction) program for the past decade – they all got stung too badly. As much as we all like conspiracy theories, the idea that big pharma is suppressing resveratrol because it’s going to make all their heart attack drugs (which dont exist) obsolete, is laughable! Sen and Das were co-editors in chief of the journal, and now, apparently since yesterday, only Sen is EIC. We’re trying to pin down details of Das’ tenure. Maybe he spilled red wine on his Western blots. It stains, you know. If that’s the reason, why did ‘they’ a) wait so long to act b) pick on this guy rather than one of the people who’s published more, better-cited work on this topic? If they’re a conspiracy, they’re a crap one, so why worry? Anita’s comment is ridiculous. And nothing wrong with a witchhunt every now and then, since there are witches out there. Indeed, science now sadly has a high proportion of witches. Politics are involved in everything, but the motivation is irrelevant – only facts are relevant. If work is problematic on scientific grounds, then it needs to be exposed. I note with amusement that Das, in one of his letters which Retraction Watch links to above, repeatedly refers to a purported conspiracy against Indian scientists. What a bunch of nonsense, and a classic ‘discrimination’ reply. I’ve seen this card played in Canada without merit. Das and others are just going to have to accept that science should be objective, and most scientists want it to be objective. If the work is junk, the work is junk regardless of the cultural/geographic background of the investigators. If the work isn’t junk, I – and I suspect most other scientists – could care less about the cultural/geographic background of the investigators. People busted for financial and scientific fraud should get huge amounts of jail time. There is not enough penalty to discourage this sort of thing. I am aware of one case in the scientific sector where an individual was jailed for fraud. See Poehlman, Eric. I do not think this deterred Anil Potti, Bulfone-Paus, or anyone else in possession of photoshop and questionable ethics. How much jail time is sufficient for a deterrent effect? The very few studies I am aware of that have actually looked at increased jail time as deterrence show that the most dangerous offenders are not deterred by stiffer penalties. Regardless, whether or not you or anyone else can describe what is ‘enough penalty’ it will still be a matter of opinion. One which with which I will likely still disagree. Most criminologists now think the death penalty doesn’t decrease the murder rate. As it is, serial fraudsters face bans from funding agencies and ostracism in their fields. I doubt the added threat of jail would have kept any of the people I’ve mentioned above from doing what they did. Scott Reuben, who fabricated data in part on Pfizer’s dime, recently spent six months in a federal penitentiary on a health care fraud conviction http://www.anesthesiologynews.com/ViewArticle.aspx?d=Policy%2B%26amp%3B%2BManagement&d_id=3&i=March%2B2009&i_id=494&a_id=12634. Thank you, Adam. I was unaware of that case. The other thing that journals do not do that would make the scientific literature much more open and interactive is to have on every paper a link you can post comments on the paper. Every news organization and blog does on the web, why not scientific journals? Every time one of these frauds is unmasked there are posts in the comments here where there is someone saying “I knew something was fishy”. Those sentiments were never attached to the authors or the paper in question because there is no place set aside to do that on most of the journals. It’s time for the journals across the board to provide that place. The whole submit-a-letter-to-the-journal process is too formal, takes too long and discourages open discussion about a topic. Excellent point. All journals should have ‘comment’ options with articles. That said, we would then run into the possible problem of said journals banning certain commenters (and you can ban someone using their IP address, not just their username, thereby getting around the ‘problem’ of a commenter just switching user IDs) that are too effective at exposing and embarrassing the journal. Corrupt newspapers are starting to take this ‘banning’ approach. I know, I’ve seen it firsthand here in Canada. No doubt. I agree with Retraction Watch’s position on this front. That said, we are starting to see some blowback against “internet democracy” out there on many angles. Banning of commenters (which would effectively be “post-publication peer-reviewers” in the science world) is becoming more common, and the “banning” tools are becoming more effective (i.e., banning based on IP addresses and not accepting comments from so-called ‘anonymous proxy’ services – both of which can be quite difficult to circumvent). Thus, we need to be vigilant that what appears to be an ‘open and transparent’ post-publication review process actually is ‘open and transparent’. However, almost anything is better than the current approach. PLOS ONE for example already has a comments section. Average number of comments per paper: 0. See the comments section for my view on portions of this paper. I read , with some trouble, Dr. Das’ response to the charges. (http://chronicle.com/items/biz/pdf/Exhibit%2036%20-%20D%20Das%20Responses%20to%20Draft%20Reports.pdf). An excellent point. Das has a number of first authorships in the literature, and the first author position should be restricted to the article writer. Thus, poor English in such a reply to an investigation, yet excellent English in articles he purportedly “wrote”, calls into question who may have written some of these articles. Appropriate authorship attribution is an important issue as well that needs to be investigated with regard to this case. True, and good points. It actually raises a broader question of relevance nowadays. Should authors have to disclose in the Acknowledgments section (or elsewhere) the use of ‘editing services’, as I have seen such services engage in far more than just ‘editing’ for basic grammar and spelling? Very often, original ideas and insights – which could broadly be construed as significant contributions – arise from such ‘edits’. Perhaps he should have employed the same ‘editing service’ for his defence to UConn, as it is a most embarrassing read. Maybe a rapid survey for plagiariarized contents is advisable. In a similar situation, Dr Leonardo Gomes the Forensic Entomologist from Brazil, also proved to have a quite poor English proficiency, however he is the first author of 99% of his papers and earned a lot of funding over a 5-year period. In the end now he is generally known as a recurrent plagiarist, as can be directly attested by Googling random passages from any of his papers. Money? The fact that the “chattering classes” want to live to 120 and drink red wine, their favourite tipple, fits nicely in business plans. Businessmen are selected on their ability to make money. Some will have seen the opportunity. A funny thing about the 120-year-olds. According to the UConn press release, it’s 60,000 pages. Have they said that’s wrong? If you read the executive summary, the page numbers at the bottom say 1 of 59929. The first 49 pages are currently all that is available – the executive summary. I would really love to see the whole thing (although the response from Dr. Das says that it kept crashing his computer.) Ivan, if it becomes available, will you please provide a link? Don’t know who in the world will have time to read the whole thing (according to Das, his lawyers and doctors said it would take him a year to read it!) but I would love to see it. Thanks. ….”(Line 10 of his letter). What is going on? Das’s replies to the allegations are nothing short of insane. His writing is completely incoherent, yet grandiose. I can’t believe this person is a doctor at all. I really wonder whether he had a stroke or a psychotic break a few years ago, and no one noticed (or no one said anything). I actually wonder if this is a mental illness issue, rather than normal scientific fraud. If this investigator was fabricating data for such a long time and in so many articles, why did the self correcting nature of science not kick in? Were others able to replicate his research? If not, did anyone speak out? Its also bizarre that this did not get uncovered earlier, considering the number of people in the lab who must have aware. The so called self-correcting mechanism did not click in early probably because all involved were busy chasing $$$$’s and/or preparing more manuscripts – pursuit of money and fame. The “self-correcting mechanism” obeys Newton’s first law of motion: it applies except when it doesn’t. I hope that clarifies the situation. If in doubt check for dampness behind the ears. The self-correcting mechanism only kicks in when individual scientists step up, question the status quo, and correct things. In my opinion, those who view science as ‘self-correcting’ take that for granted, and therefore are more likely to let others be the ones that actually correct the record. Whether you’re a 1st year grad or a PI on a gravy train, it takes courage and fortitude to look at a positive result someone shows you – one that tells you what you want to hear- and then say, no – this is incorrect (or too good to be true). The analogy to Newton’s 1st law is apt. It takes a new force to change the momentum in scientific research. Even if misconduct is implicated. Sad. It’s been said it takes twenty years to establish a reputation, and 5 minutes to destroy it. Distressing news but very interesting. I am surprised he went with the race card. I think he would have found a nice home with the homeopathy whackadoodles if he’d just accused all and sundry of being agents of “Big Pharma.” I suppose one could argue that his ties to Longevinex would seem to make this hypocritical, but he hasn’t exactly seemed compelled to keep his claims factual in the past. That said, if Anita’s comment above can be taken as typical of the average kook, perhaps he’ll be welcomed into the anti-science conspiracist fold de facto. One of the issues is that it takes so long to verify these things, and the truth is that nobody would ever bother to double check anything published outside of Cell, Science or Nature. Anything else would be a waste of your time (meaning less of your publication, meaning less funding, meaning no tenure….). People who double check on big journals usually do so because they have been scooped, have the set up ready and want to follow up. A system in which each scientist would be expected to reproduce the results of a given number of papers every year would be very beneficial. On one hand, the overall scientific output would decrease (would it be bad? ), on the other hand quality would increase because results would become more trustworthy. As time goes by, the checking would result in fruitful scientific collaborations: while checking A, you may refine their results, get in touch with them and become collaborators. This would densify the network. The double checking could be handled like an open review process, maybe by the journals themselves, and funding agencies would have to accept that a 50% over-head on any funding has to go into the double checking. The capacity to effectively be a trustworthy double checker should become a component when estimating the quality of a lab (i.e. would you believe the unbelievable claims of a lab never able to replicate any fellow results). Cedric is right. No wonder he almost won the Magician contest over the goblet of fire. Some people have to question experiments, and repeating conditions is fundamental for the survival of science as a whole. Cold areas and cold journals are safe grounds for fraudsters as they can survive enough to get away unscathed. I am a grad student at UCHC. I did know a couple of people in Dr Das’s lab and interacted with them outside the lab. I was always surprised at how rapidly they seemed to produce data and got tons of publications where we struggle to get our experiments and papers out. Also, their work seemed to be very compartmentalized- as also mentioned in the report. It was like an assembly line moreorless-that way I guess one person did not get to know about the other’s manipulation in details. Ofcourse I never did know the lab secrets. Also since I am not in the same field- I never did take a glance at their actual data/papers. Today- the whole thing seems to fit in with my observations. I was appalled and felt ashamed. A very wrong thing to do. Compartmentalization is a tremendous problem for multiple reasons, not the least of which is that students and post-docs don’t learn anywhere near enough about how to do science in a lab where one person does the cloning, another the mutagenesis, a third the transfections and yet another (most likely the PI) does the assay readout. The big question not being asked is who?, what lobbyists?, congressmen?, and perps representing what corporation?, ..was it wine marketing boards?, grape marketing boards? etc…the wine glass marketing boards.? Who concocted the scheme?….. for the flow of money from the American government to this bunch of crooks….Probably the same ones who sent out all manner of sensationalist press releases about — “its OK for pregnant women to have a glass of wine”….or was it the crooks making money off of children with fetal alcohol syndrome?….what is wrong with this picture? This is a government run by elected officials who can’t help out foreclosures of families…but can bail out big banks, and help out the 1% and all manner of marketing boards….with incentives and subsidies? Who is sailing the ship….Carnival? It’s interesting as to how these guys get caught in their own webs of lies. What makes an anonymous allegation of misconduct get noticed and why does the allegation come when it does? I have contacted journal editors about some of the manipulations and discrepancies that have appeared in their journals and most are polite but firm in their refusal to accept that they have published erroneous data for all to see. In particular, the research culture in India is that these senior scientists close ranks and cover their tracks quite well. They blame students and other scientists instead. A while ago, a friend of mine came across a proposal to investigate the antidiabetic potential of Aloe vera gel extract. The proposal was submitted to and the funding approved by a governmental funding agency in India for the work to be started by the academic-industrial partners who had written the proposal. The premise of the proposal is that Aloe vera gel extract has antidiabetic properties and can be used to treat diabetes in humans. To get the funding, the investigators have claimed that the work is patentable and that the academic partners already have a patent and a 2008 publication in this area (Current science, vol. 94, no. 8, 25 april 2008). A look at the Internet shows the number of publications and all the information about Aloe vera and its potential use in diabetes. Much of this information was available before 2008 which is when the academic investigators published their work on the antidiabetic activity of Aloe vera gel extract in diabetic rats. But no questions were raised about the patentability of this work which was not novel or on how the investigators got a patent with this work. The 2008 Current Science paper cites many papers describing very similar work, including a 2004 Journal of Medicinal Food paper by Rajasekaran et al. which actually gives the dose of the Aloe vera gel extract used in that paper in diabetic rats. Noor’s 2008 paper uses the same dose and states that their results “corroborate” the results of the earlier paper. Rajasekaran (the first author of the Journal of the 2004 Medicinal Food paper) has published another Aloe vera extract paper in 2006 as have other people about the antidiabetic activity of Aloe vera. How did the journal accept such a paper and how did the funding agency give funding to a project that was derived from other people’s work? Does this count as plagiarism or just lack of due diligence by the funding agency and journal editors? There’s a word for that kind of behavior but I don’t know if it’s printable in a family magazine. Another reason for the busy clinician to avoid unconventional remedies. No-one involved in this lucrative copycat-ism wants to rock the boat; they count on the fatigue of people who discover their shenanigans and try to complain to the “appropriate” authorities to no avail. Conrad has accurately assessed the game: fatigue plus stifling criticism. It’s rampant in the enviro-“sciences” (now becoming an oxymoron) as well. Hahahahahaha…. best laugh of the week so far, and it’s only Monday. Keep ’em coming! 1) Claim that UConn “posted a website” containing 60,000 pages of allegations. Not so. Website does not exist. An abridged version of the report was made available, but the entire 60k document has not been released. 2) Claim that UConn investigation encompassed ALL of Dak’s research going back 4 decades. Not so. Only 145 counts of image fraud across a few dozen papers. The allegations are highly selective and accurate, and do not question his entire output. Later he says he is accused of fraud dating back 30 years, then 40 years, then elsewhere 44 years. You do know that ORI has a statute of limitations of 6 years, right? 3) Rambling narrative about students, former students, locked door policies etc., with NO NAMING of anyone involved. At the very least, when refuting such charges, cite credible names for the people you are basing the refutation on. 4) Claim that resveratrol is the “only agent under scientific investigation that can prevent sudden cardiac death”. Is this is true, WTF are all the rest of us wasting our time on? 5) How did the alleged image manipulations pass peer review? They didn’t! This is evidenced by a number of retractions, corrigenda and errata, on Das’ previous work before all this stuff surfaced. 6) The best one of all… “Scientific journals DEMAND that all western blot images be enhanced before publication”. WTF? They actually demand the opposite – that no manipulation of any kind occurs, and the image should be as close as possible to the original (i.e. un-enhanced). 7) Claim that the University, when asked for the hard disk, said “we lost it”. Really? That’s a pretty serious event, one which you think would be publicized. Has anyone from the University ever gone on the record as saying that the hard disks were lost? No, didn’t think so! 8) Claim at 17 min. that he never used federal research funds for resveratrol research, only the consulting and industry money. Why then, do the papers on resveratrol acknowledge federal funding? Why then, is NIH ORI involved (they only investigate if work was federally funded)? 9) Claim regarding the way in which the investigation was handled, and the University’s refusal of an appeal… “even NIH said it is wrong”. Really? I recall no statement in any way implying that NIH found fault in the investigation. The best bit of all, around 15 min., he does acknowledge that western blot images were manipulated, but says that it was only done at the demands of journal editors. This is actually the first time (I think), that he’s on the record as saying the manipulations did occur. Well, at least that’s one useful thing to come out of this video. 1. The website did exist, with all 60,000 pages of allegations, but was taken down by UCONN. 2. Not so. UCONN is sending letters to journals seeking retraction of all of his papers. 3. Former students and Dr Das’ attorneys were interviewed. Bringing their names into the write-up would be inappropriate and immaterial. Dr Das’ attorneys were William Gagne and Scott Tips. 4. Statin drugs and aspirin do not prevent mortal heart attacks; they do reduce non-mortal events. If you find other agents that prevent mortal heart attacks, as demonstrated in animals or humans, please forward evidence of same. 5. What I am calling to attention is whether the journals did their job in adequate peer review? It is the journal editors who demand alteration of western blot images for purposes of print reproduction. The very least journals could do is put an asterisk next to enhanced western blot images that link to the originals. 6. You obviously have not read recent write ups in journals about western blot imaging quality. There is a current topic of discussion. 7. You can call up Dr Das’ attorneys if you desire to learn that U CONN claims to have lost their disc of original western blot images. You would have no knowledge of this unless you were privy to what went on inside the proceedings against Dr Das so I don’t know why you think this is an impossibility. 8. That is Dr Das’ testimony, that largely his work was done with private funds and I think with one exception did not involve NIH grants. The NIH ORI has distanced themselves from this university action. I contacted them and received an e-mail saying Dr Das’ work was not under current investigation. 9. NIH did not say it was wrong, to my understanding. Please provide evidence of this. Your response is evidence of ignorance of the facts involved in this case and an undeserved belittling of Dr. Das’ work. Your opinion is an opinion. Where is substantive evidence against Dr. Das? We all have to rely that UCONN presented accurate and fair evidence that Dr Das committed scientific fraud. When Dr Das is not given an opportunity to present evidence on his behalf before a review board, he was denied due process. Why? If you want to analyze Dr Das’ body language to determine guilt, that is your prerogative. Should we hire you to make a final judgment? And like so many outspoken critics, you aren’t using your real name so it is easy for you to fire off your opinion. For now, all we know about you is that you are a puzzled monkey. Second, he says that he has written over 500 papers and that many of these are “top ten level.” What does he mean, top ten of what? Of the year, the decade, the journal, his discipline? This is presumptively delusional since it has no referent. Then there is the “cited over a hundred times”: which one of the 500 papers? Then, the “high impact factor”–so what? That’s not evidence, that’s a statistic. Most readers of RW are suspicious of people who publish so many papers and don’t believe that they could represent actual, personal research. Do the math: he would have had to publish over one paper a month, on average, to get that total, and this would be practically impossible for one person. Third, he says “…and that’s why I’m famous…I’m mostly famous on redox signaling, which I started…” He’s not THAT famous. He did not START the field of redox signaling. These are extremely high self-assessments. Fourth, he says, “…there is no one can challenge me, and no one understands this even in the health center.” There is no one who can challenge him? No one understands this? Science is supposed to be challenged; it’s called hypothesis testing and independent replication. What is it that no one understands? Redox signalling? The implications of his research? The fact that he is without stain? These are delusional statements. Your reference to body language reminds me: while he is saying these things, he has his head tilted back, and he nods repeatedly. This conveys the impression of very high self-regard and contempt for the audience. The video tries to give the impression that all thirty years of Dr Das’ work was alleged to be fraudulent, when in fact the investigation apparently only covered the last six years of papers. So why does he find it necessary to talk about thirty years and five hundred papers? Because his self-image is threatened, and he is reacting in a blind defensive fashion, rather than acknowledging the real questions about the recent work that were the subject of the inquiry. The video continues with the “locked door/open door” controversy. What does the question of access to his computer have to do with the altered images? His claim that he didn’t alter them, or his claim that the journals asked him to alter them? Here he is projecting the accusations onto his laboratory assistants and trying to confuse the issue. This video was clearly very expensive to produce. Unfortunately, I could not continue past the first five minutes due to intense antagonistic feelings on my part. These feelings are usually triggered by a sense that I am watching something blatantly false; yes, that is my opinion, and I can support it with waste basket leavings. Your company, Mr. Sardi, may have had something to do with producing this video; I haven’t seen the part that says who paid for it. It is clearly intended for general audiences and clearly intended to promote a single thought: resveratrol, or Longevinex, is good for you, so you should buy it and take it. Dr. Das is the victim of a smear campaign by an investigative committee that had nothing better to do with its time; he is a famous, highly decorated researcher who personally is the father of the field of redox signalling and has never done anything underhanded despite publishing over five hundred papers. Forgive me if I am more than a little skeptical. If Longevinex is so wonderful, why not apply for FDA approval? You could save the money you threw away on this video to start paying for the FDA studies. I’m tired, and I’m not getting paid to do this. 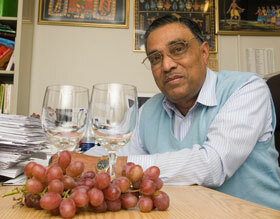 Would you mind providing substantive evidence of Dr Das’ alleged fraud? Do you think Dr Das should be given any opportunity to defend himself? It still is a country where “innocent until proven guilty,” correct? Regarding Longevinex and FDA approval, I can only say you are an ignoramus. It is not a drug and doesn’t pretend to be. However, how would you propose to move forward in proving a pill like Longevinex prevents mortal heart attacks? You would need to take high-risk patients and give half of them the Longevinex pill and half of them an inactive placebo, according to the conventional approval process. This would be entirely unethical. Because this cannot be ethically done, no progress can be made. What humanity is left with are no agents that prevent mortal heart attacks. Statin drugs and aspirin largely prevent non-mortal events. The only way to move forward is to show a pill like Longevinex is relatively safe and then allow it to come into common use and retrospectively evaluate the number of mortal heart attacks among high-risk individuals compared against the current standard of care. This is how aspirin was initially approved for the heart. There is no provision with the current regulations for a pill like Longevinex to gain approval for what was demonstrated in the animal lab. By the way, have you written 500+ published papers like Dr Das? Me provide substantive evidence? You’ve got the wrong guy. I’m not investigating anybody, least of all you; all I’m doing is giving my clinical opinion about how Dr Das looked on an expensive video made by someone who was forced to use Dr Das’ own words to defend him with (makes you feel for Mr Sandusky’s lawyers, doesn’t it?) If you want answers to questions about evidence and due process, look at what the constituted authorities have said. Don’t demand anything of me. I’m not getting paid for this. “Ignoramus”: an ignorant person… You can’t tell me that resveratrol is not a “drug”. Anything can be a “drug”, whether it is single small molecule, a mixture, a protein, or even an entire organism. It would be perfectly ethical to give resveratrol to half of a group of people because there is NOT YET any prospective evidence that it provides a benefit to humans. If the trial started to run all one way, it could be suspended early, according to protocol. Statins and aspirin prevent mortal as well as non mortal events. That is why high doses of Lipitor reduce total mortality. That is also why an oral aspirin is recommended to all at the first sign of heart attack, to prevent early demise. And no, there is no provision for approval by FDA based on animal studies for the obvious reason that FDA doesn’t treat animals. What you’re saying is that you can’t afford to go through the costs (enormous) of getting FDA approval and you can’t convince a company that does have the resources to go through it; why? Either not profitable enough or not effective, take your pick. You’re just trying to make a profit in the “alternative medicine” field without going through the basic steps of proving that you’ve got something really worth while. No, I haven’t fronted 500 papers, but remember, even a cat can look at a king. Meaning, it doesn’t take an Einstein to realize that Das is living off the labor of innumerable graduate students and hasn’t had an original thought in 29 years. The only reason I said that is because you called me an ignoramus. I don’t like ad hominem attacks and I try to avoid them at all costs; I wish you would also, person without even an honorary MD to his name. No, i don’t think saying he’s delusional is ad hominem because it goes to the heart of the problem with his research. He’s got it into his head that whatever occurs to him must be true, and if the research doesn’t back him up, then he has the right to distort it because he knows the truth. Nobody has questioned the work he did 30 years ago, only the work he has done very recently, and only specific issues. He is the one who has put his entire reputation and all 500 papers on the line with his delusional defense. Your second mistake was to commission an expensive video to try to salvage the reputation of Longevinex and to allow Dr Das anywhere near the production of the video. Jeez, am I tired of this. Are you trying to wear me down and how much are you making by the hour? I haven’t even posted my reply yet and you’ve got ANOTHER comment. So what you’re saying is that only people who have published 500 or more papers have the right to criticize Dr. Das? Claim that resveratrol is the “only agent under scientific investigation that can prevent sudden cardiac death”. I[f] this is true, WTF are all the rest of us wasting our time on? besides, both ASA and statins do prevent sudden as well as gradual cardiac death, and what difference does it make what is the final insult? They reduce mortality, period.